Creativity has been a bit of an escape in an otherwise busy and quite stressful week - moving Dad into respite care so Mum gets a bit of time to herself was met with mixed feelings all round. Dad, however, is blissfully unaware of the situation, which is something to be thankful for. Alzheimer's doesn't give you much to be thankful for so you need to take it when you can. He's booked in for three weeks, which gives us all a little breathing space and hopefully gives Mum the opportunity to make friends and attend some social activities at her retirement complex. The care team there will get a break too from constantly rounding him up and taking him home! 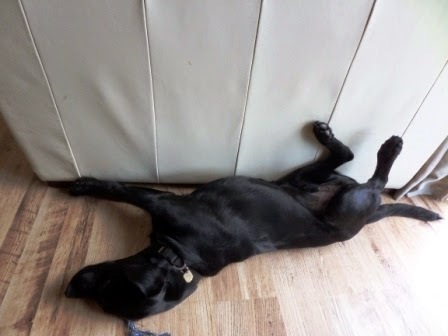 Quentin, meanwhile, is busy doing all the things that Guide Dog puppies do - and some things he shouldn't be doing, too. He has layers of blankets and quilts in his bed and - yet again! - he's worked hard on de-stuffing the comfiest one (will he ever learn?). Sadly, my sewing machine needs attention, so the re-stuffing and reinforcing that needs doing will have to wait - a less comfy bed for the next few days awaits him! But maybe he doesn't mind at all - he looks surprisingly comfy on the hard floor at times! Hope your week has been a good one. Join in with Handmade Monday to share your news and makes with us. Oooh i love what you've been doing with the fabric backgrounds for your images, it adds a lovely depth and sense of texture. It must be so hard for all of your family coping with your Dad's illness, it sounds like a short break will do your mum some good though, i hope she makes some new friends. The fabric background looks really good. It adds so much texture. Quentin looks great as usual. Losing his puppy look in the face I think. Still huggable. 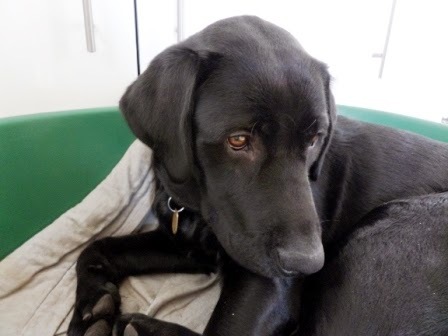 Quentin is growing into a fine dog, very handsome. I am sorry to hear that your dad needs respite, but at least it will give your mum time to settle in and meet more people. I really like the way you're incorporating fabric into your designs. I'm so sorry about your dad but it's good that he's settled in for a few weeks into the respite home. 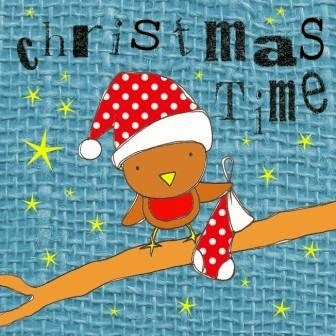 Aww that's such a sweet little robin - I can't believe how quickly Christmas is coming!